Bob “Dr. 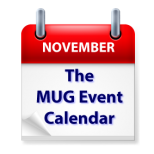 Mac” LeVitus’ visit to a Colorado user group tops this week’s MUG Event Calendar. Other interesting topics on the calendar include a German group’s look at Microsoft Office alternatives, a Michigan group’s look at the iOS version of Photos, and an Oregon group’s look at all the new Apple products.